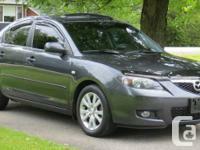 This 2004 mazda Mazda6 available from Lone Auto Sales with Stock #14-440 is priced at $4495.00. Powered by a 3.0L V6, this 4 door, Grey Sedan has 244000 kms on it and features a Grey interior and a 5 Spd Manual transmission. **********ALL VEHICLES ARE SOLD CERTIFIED AND E-TEST UNLESS OTHERWISE NOTED. THIS IS A UCDA APPROVED DEALER. *BUY WITH CONFIDENCE* ALL ARE VEHICLES ARE CERTIFIED ABOVE MTO STANDARD**********. * TRADE INS ARE WELCOME* * FINANCING AVAILABLE GOOD OR BAD CREDIT * *NO HIDDEN FEES* ***TO VEIW OUR INVENTORY CLICK ON VEIW ALL ADS ON THE RIGHT SIDE **** IF YOU CANT FIND THE CAR YOUR LOOKING FOR PLEASE CALL AS THERES LIMITED INVENTORY ONLINE. *COME IN ANY TIME BETWEEN BUSINESS HOURS FOR A TEST DRIVE* **NO APPOINTMENT NECESSARY** FOR MORE INFORMATION ON THE CAR PLEASE CALL (905) 920 0303 ASK FOR NEIL.